You can never have too many screwdrivers. I have probably got more screwdrivers than I have got screws. Most rooms in our house have a drawer with a screwdriver in it somewhere. 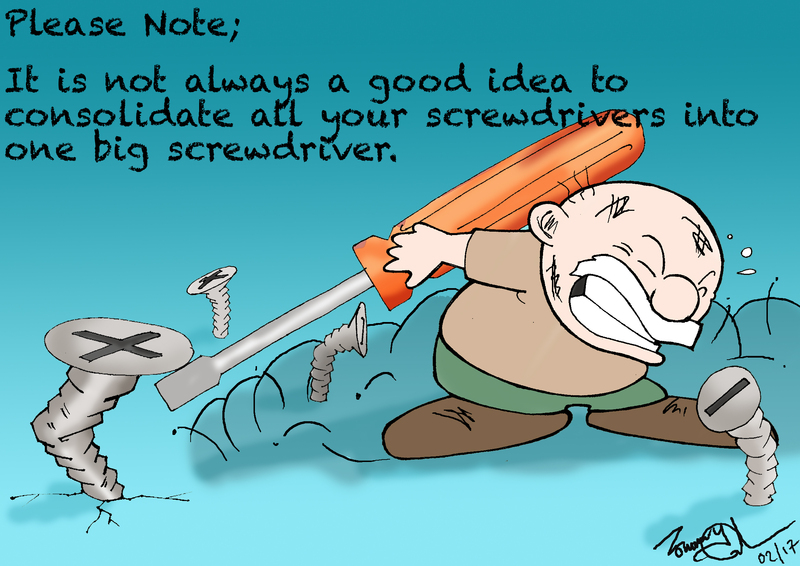 The trouble is that when you need a screwdriver, it is probably the wrong size for the task in hand. Long screwdrivers won’t fit in small spaces, but short stubby screwdrivers are can be hard to grip when faced with a screw that has been screwed in for a centaury or two. The little Christmas cracker sets of screwdrivers are virtually useless for anything, but I still have quite a few from Christmas’s long past. That Phillips fellow, whoever he was, has a lot to answer for. He must have doubled the number of screws and screwdrivers in the whole world when he invented cross headed screws. So for every type and size of screw I also seem to have an appropriate cross headed screwdriver. Still there is always a screw loose in our house somewhere. Hence the abundance of screwdrivers. There must be a better idea for dealing with excess screwdrivers. Any inspiring ideas ? Now then lad! Do you have a ‘screw loose’? Or have had or do have one too many ‘screwdrivers’: Remember that evening when one was a ‘lounge lizard’, or lothario, in ones younger days: The tipple that now refreshes other parts that cannot be reached –Was a ‘screwdriver’ a vodka and tonic? Or gin and something else? My memory is a blur. Old age and respectability do not allow me to think further! Now then in ones haste to shuttle off to buffalo with one prized screwdrivers, and dump them in the ‘Shed’, do not forget those occasions, not frequent, but often in the darkness of the night, one needed a screwdriver, to access or mend that; odd fuse; loose shelf; loose light or power switch; or that cupboard door hinge that was collapsing into a heap, or one’s humble spectacle frames. So good mystro remember that long narrow chocolate (CADBURY’S) finger biscuit tin Auntie, presented to you at some festive occasion; now is the time to strike! Like a coiled snake full of venom and purpose. Do not forget the car in the boot maybe the box of spanners etc. In this box in the boot keep a stubby blade and Philips screwdriver for that very in frequent occasion when one is adrift in a sea of tranquillity, and horror, far from home, and maybe they can save the day, until that friendly green flag/AA or RAC man turns up. cocktail history:: Vodka and orange; ‘A screwdiver’?? ?